Tres Amigos from Playtech is a machine that severely lacks charisma, excitement, and any form of innovation. It’s one of those nods to classic casino gaming that feels lazy as opposed to fondly reminiscent of a simpler time. It offers no bonus stages, and no special features. The Mexican “friends” theme would be questionable on an action-packed title but on this one, it just makes the whole package even more lacklustre. In terms of specifics, it’s a three row, three reel game with just a single win line. Fans of classic casino experiences MIGHT enjoy the title but in 2017 it’s hard to imagine many can tolerate such an uninspired effort. As one of the industry’s leading names, Playtech can do far better. Overly simplistic. Would feel dated in 1997, let alone 2017. 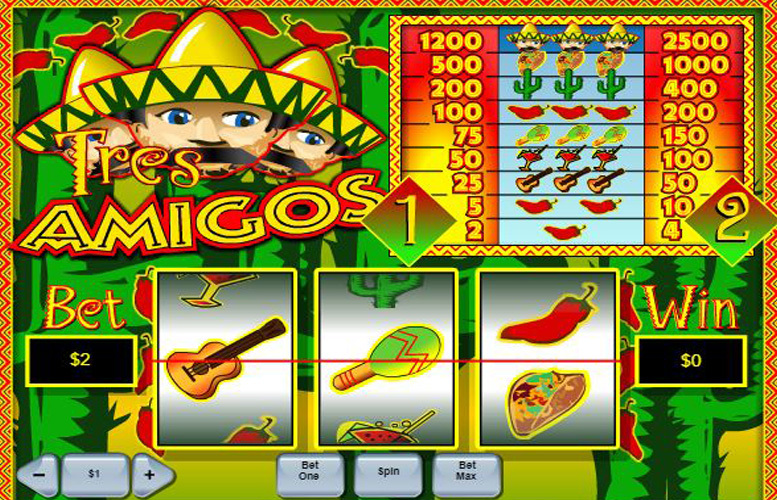 The highest prizes in the Tres Amigos slot are awarded for hitting three-of-a-kind “amigos”. This is the game’s only real feature. If you study the pay table, you’ll notice that betting one coin wins a base amount whereas betting two wins double. This remains true until the very largest prize. Here, the pay-out is more than double by a small amount. Players enduring this Tres Amigos should always take the better value approach and use two coins per spin. Why anyone would play with a single coin per spin is absolutely beyond me. Three-of-a-kind “amigos” = 1,200, 2,500. Three-of-a-kind tacos = 500, 1,000. Three-of-a-kind cactus = 200, 400. Three-of-a-kind pepper = 100, 200. Three-of-a-kind maracas = 75, 150. Three-of-a-kind cocktails = 50, 100. Three-of-a-kind guitars = 25, 50. Pair of peppers = 5, 10. Single pepper = 2, 4. If you’re including the fact that there’s a tiny bit of extra value per spin in betting two coins per line on every try of this machine as a feature, then there is one bonus feature on Tres Amigos. Like us, you’re probably not, and therefore this section featuring the game’s features will remain featureless. The lowest possible coin value is just 1p, and the highest is £5 on Tres Amigos. With the choice to bet either one or two coins per line, players can therefore bet between 1p and £10 per spin. Clearly, the title is not built for those higher rollers out there. It’s difficult to imagine who, if anyone, the designers had in mind when creating the game. In case you couldn’t tell, we’re far from impressed with this offering from Playtech. It might be possible to find someone who particularly loves the most basic casino games out there and has an inexplicable love of all things Mexican, however, most will find it incredibly dull. I get that Playtech might want to cover the market of people who do like the most basic games around but why even give it a theme? Why not stick to classic fruit machine symbolism and leave it at that? There’s already far too many of these single win line, no feature offerings in their catalogue, we don’t need any more. This game has a rating of 2 / 5 with 287 total reviews by the users.